For a good chunk of my life, I didn’t like tomatoes. I thought they were mealy and rather “bleh” in flavor. I’d pick them out of salads, burgers, well….pretty much out of everything. And you know what the problem was? For the first 20+ years of my life, I was eating BAD tomatoes! Needless to say, I was missing out for so many years! One of my favorite ways to enjoy fresh tomatoes are in Bruschetta. The simplicity of ingredients paired with the herbaceous basil really highlights the true flavor of the tomato. On its own, it’s quite fabulous but I decided to add a spin by throwing in some smoked mozzarella cheese I stumbled on at my local specialty market. It was perfect! In a bowl, mix together the tomatoes, cheese, basil, garlic, vinegar, and oil. Season with salt and pepper. Cover and refrigerate for at least 20 minutes. Taste and adjust seasonings accordingly. 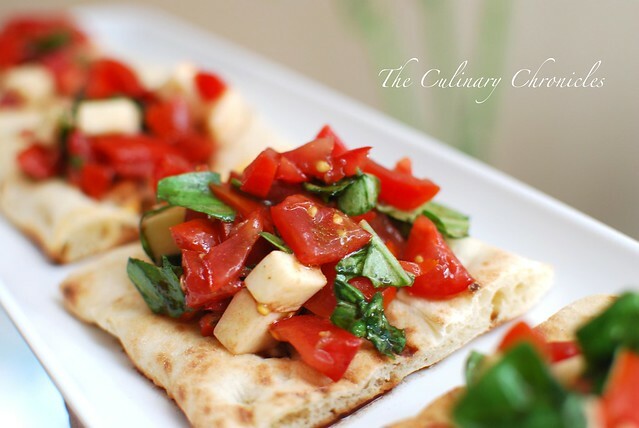 Serve with your choice of flat bread or toasted baguettes. The colors in this dish look wonderful. I love the addition of smoked mozzarella in there too, I bet that adds a lot of flavor! I love bruschetta! This is the only way my husband eats tomatoes. I agree with Lindsey that the smoked mozzarella makes the dish. I will make this for my family’s Tet party. It looks super good, easy, and healthy. 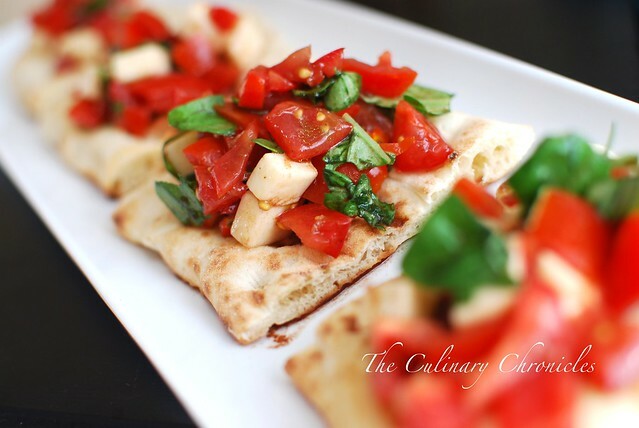 Flat bread is an awesome idea. Love ya, CC.